Time tracking software are so much hassle to use. The report of time tracking software are boring and unusable. If you agree to those reasons then read on. Otherwise tell us what you think in the comments section below. If you have a time tracking application that’s really easy to use and provide informative reports, it should motivate you to track your time more to improve your productivity. You can easily enter data to it just like writing into a piece of paper but doesn’t come with the hassle of manually tallying up those data. In short it should be like a magical piece of paper – the ones that you see in Harry Potter movies. Besides ease of entry, the application should provide easy-to-read reports that motivates you to focus more on activities that are worth doing. That is it recognizes that some activities are high-value and should reward you more when you do those activities. Similarly it should allow you to identify the times when you are spending huge amounts of time doing activities that are not worthwhile. How can we help you on this? Simple. 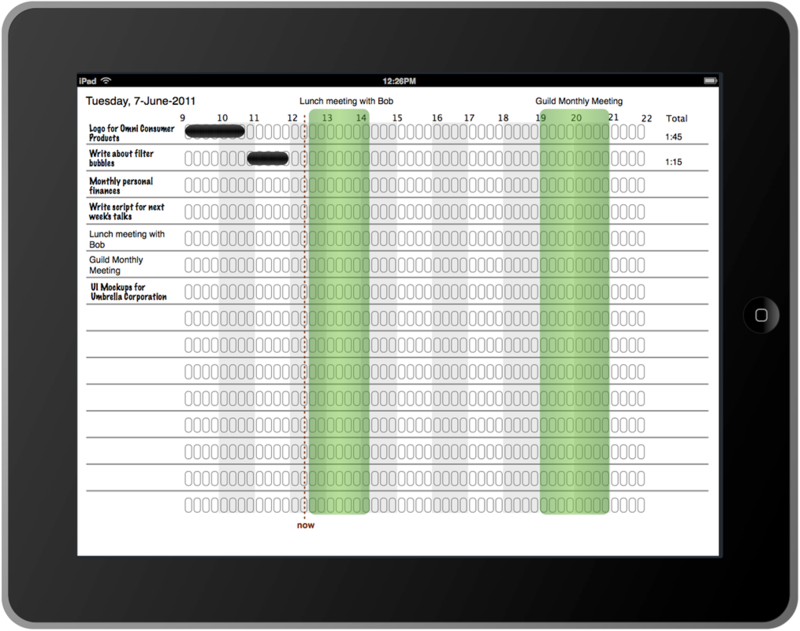 We are developing SparklingSheet, an application that makes tracking time easier and fun to use and also create fun and useful reports from those time sheets. When you see your entire day of activities shown in a single sheet, you can quickly get a feel of your entire day. 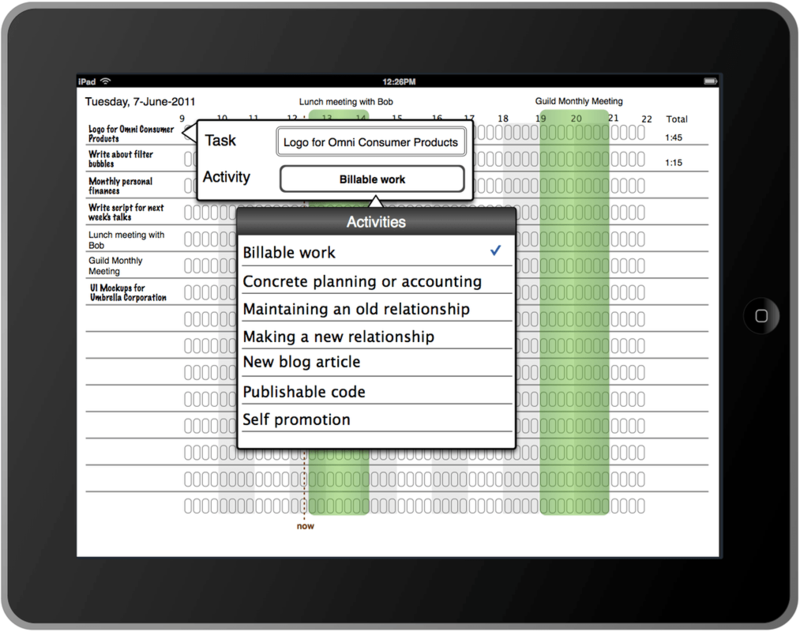 Your tasks are listed on the column in the left whereas each row contain 15-minute slots that you can use to track the time you spend doing that task. The red dotted line shows the current time and this line moves to the right as time goes by. Each task is attached to an activity. These activities are like task categories. and In turn they determine how important are the tasks contained within them relative to each other. 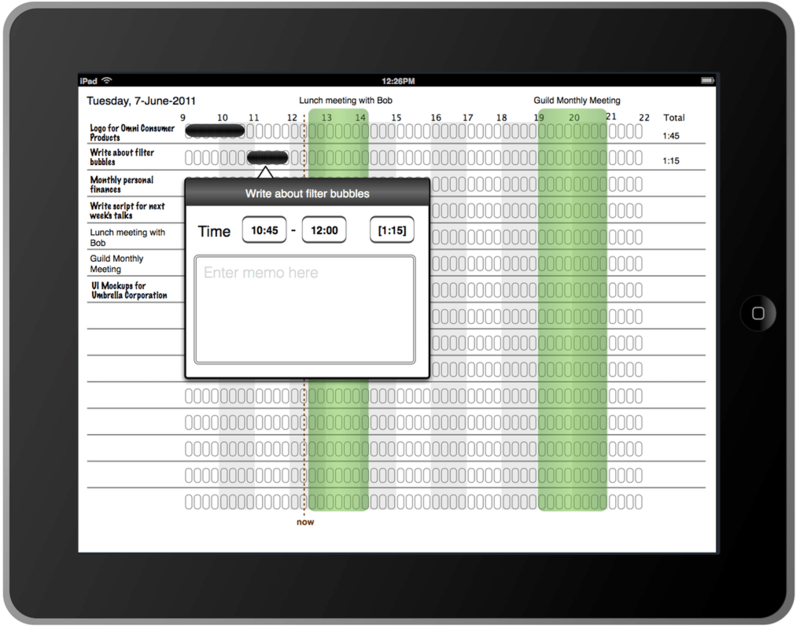 To track time in an activity, simply scrub the time slots to create a time block. You can also select the time block to add a memo to remind you what were you doing during that time. Besides tasks, the timesheet also shows your calendar appointments. 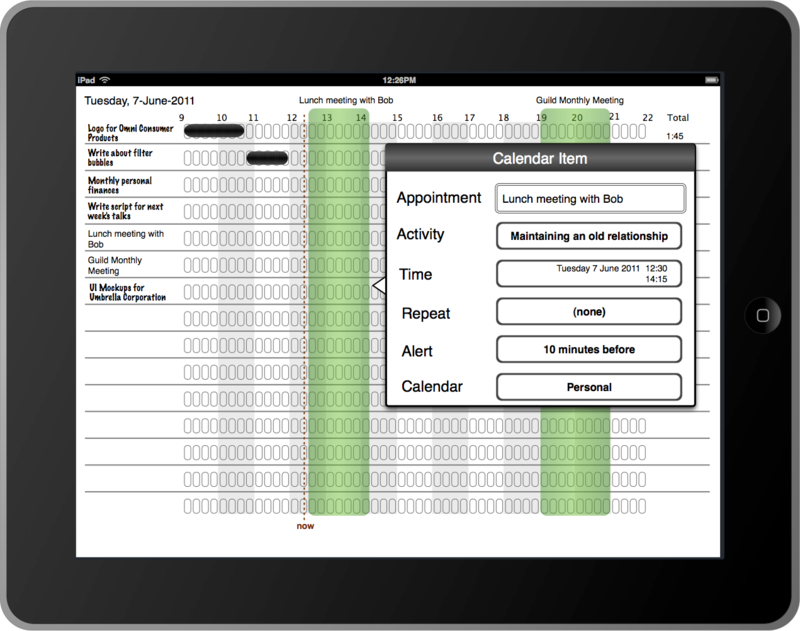 These appointments are shown as vertical bars showing that you have reserved a block of time for those appointments. In addition they are also shown in the left column together with other tasks so that you can record the actual time spent in those appointments. At the end of the week, you’ll get a report that shows what you have been doing. 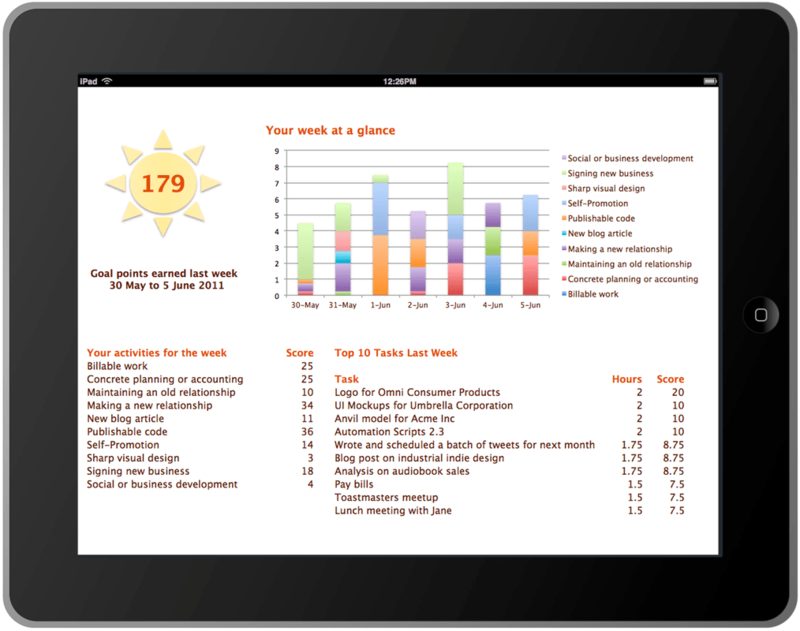 You get an overall points figure to show how productive you were doing the week as well as daily breakdowns of those points. The daily graph shows which days you were busiest, which days you were most productive, and when you were only doing lame work that doesn’t add much value. The weekly goal points are calculated from how long have you been working on tasks that contributes to each activities and how important those activities are. You gain more points by putting in more hours on high-value activities but less points when you’re doing less important low-value activities. In short, you can be more productive when you self-analyze your efforts — whether you are allocating your precious time effectively to things that matter. You’ll be motivated to track your time if the tool that you are using is easy to use, fun, and provide useful information. SparklingSheet is an application that aims to help you in this area. If you are interested in SparklingSheet, please enter your e-mail in the box below to get notified when we launch SparklingSheet. Furthermore you can download a prototype of SparklingSheet that you can play around.